Is It Possible That God Created Life On Other Planets? Do you think it’s at least possible that God created life on other planets? In the beginning, it says “God created the heavens and the earth,” (Gen 1:1) and everything else for that matter, and of course, that includes all lifeforms; mankind included (Gen 1:27). When the Apostle Peter was preaching the gospel to the crowd, he told them, “you killed the Author of life, whom God raised from the dead. To this we are witnesses” (Acts 3:15). Not only is Jesus the Creator of human life, He is also the one Who brings eternal life. Either way, it’s all about Jesus. You can’t even get past Jesus to God (John 6:44). Whoever believes in Him already has eternal life (John 3:16), but whoever rejects Him has an eternal death waiting (John 3:18), and with the wrath of God abiding on them (John 3:36b). Before asking the question of whether there is life on other planets, ask ourselves this? Have we been born again (John 3:3-7), otherwise, we cannot enter the kingdom (John 3:5), not to mention see it (John 3:3)! Many claim that life came from a foreign object from space, like a meteorite or asteroid that broke of and landed on the earth, but the question is, where did that life come from? Well, they say, “from another planet or solar system,” but that begs the question, “Then where did that life come from?” It’s the infinite regress that never answers the question about where life began in the first place, or where life came from. Evolutionists don’t include that question as part of their theory, mainly because, they can’t answer it; in fact, no man can but God and He has answered that, but most refuse to believe that only God created life (Gen 1:1; Acts 3:15). 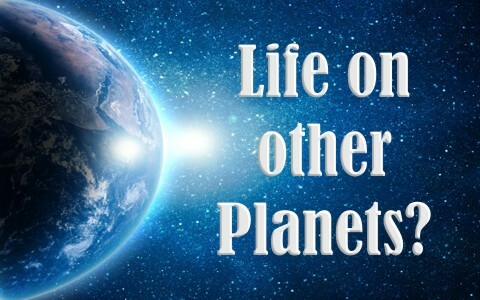 Many scientists believe that there is probably life out there on other planets, but even if that’s true, that doesn’t discount the fact that God is the Creator of that life, no matter where it’s found. Just because there is life elsewhere, doesn’t mean the Bible isn’t true or God doesn’t exist. It has nothing to do with that. It has everything to do with ascribing God as the originator and giver of life. We have recently discovered some new species in the deepest part of the oceans. Some of these have been previously unknown, and guess what? God is still on His throne. He is still sovereign. No human discovery has ever altered the fact of whether God exists or doesn’t exist. Discovering something cannot make any difference about God’s existence or not, even if life is discovered on another planet. Why would that change anything? If there is life on other planets, then that life had to have an Originator. We still need to be brought to repentance and trust in Christ, in order to be saved, whether there’s life elsewhere or not. Nothing has changed. If there is fossil evidence of life on another planet, God has not moved, and nothing about the story of redemption is changed. So what if there’s life on other planets? The existence of life on other planets doesn’t mean that the Bible isn’t true, or that the creation story is just a myth. God is the Author of life, no matter where it is in the universe (Acts 3:15)! There are dozens of places in the Bible where God’s Word states facts that were unknown by mankind until thousands of years later, meaning the Bible is far more advanced than science was (and probably is!). The earth was not flat as believed, but spherical as God’s Word declared (Isaiah 40:22), the earth didn’t rest on an elephant or on Atlas, but as we know, God “hangs the earth on nothing” (Job 26:7). If the people in the middle ages had read the Bible, they could have avoided millions of deaths, just by following the laws of sanitation that God has laid down thousands of years before. These were intended for Israel’s benefit so that they wouldn’t suffer from the diseases that other nations had (Ex 15:26). If only they had read about quarantining, the Bubonic plague wouldn’t have been so devastating. Thousands of years ago, God’s wisdom stood supreme as He commanded that those who were obviously sick should be isolated from others so that they might not become infected (Deut 23:10-11). These things were thousands of years before their time of discovery, yet science is often so critical of the Bible. They conveniently leave these facts out. If God purposed to put life on other planets, even so that scientists would discover it and claim, “You see, there is no need for a Creator,” then God would do it. He does only what He pleases and isn’t persuaded by the “wisdom of men,” which is called foolishness (1st Cor 3:19). When has God ever needed the counsel of man, or what could He learn from us? Why would a clay vessel, created by the Potter, ever question the Potter who made them? The vessel sees only the workbench that it was created on….God sees the whole shop and neighborhood. He Who formed us is not pleased when we who are formed question Him and His goodness. Who do we think we are compared to the omnipotent God? God can have life anywhere He wants to have it; in other places in the universe, or only here on earth. It doesn’t matter. God is still God, no matter what we discover! Read more here: Does Faith in God and Science Conflict with Each Other? Resource – Scripture quotations are from The Holy Bible, English Standard Version® (ESV®), copyright © 2001 by Crossway, a publishing ministry of Good News Publishers. Used by permission. All rights reserved. Dawkins, R., 1976. The Selfish Gene, Oxford University Press, New York. This is a very interesting article with a question that I have pondered. According to the Bible I see that God created the heaven and the earth and of course all of the stars, sun and moon too. You have talked about she shape of the earth and the fact that God hung it on nothing (Isaiah & Job passages that you cite). But how about we just look at Genesis. Clearly God called the dry land Earth (Gen 1:10) and then He created the creatures in the sea, air and on the earth (Gen 1:20-25) … and of course He created man and told him to be fruitful and multiply to replenish the earth … then made him to and “have dominion over the fish of the sea, and over the fowl of the air, and over every living thing that moveth upon the earth.” and so on (Gen 1:26 ff). The Bible keeps saying “earth”. Like you, I cannot find anywhere in the Bible that says there is life on other planets. I just gotta believe that God created the earth for his living creatures. We have no record that He put life on Mars or Jupiter or any other planet. For this reason I would have to answer the question “Is It Possible That God Created Life On Other Planets?” as Yes, it is possible because with God all things are possible, however, according to the Creation record it is NOT probable. Previous post: How Does the Bible Define Righteousness? Next post: What Does The Bible Say About The Ocean?